Cuala are starting to have that sort of vibe about them now. Take Con O’Callaghan as an example, albeit the most extreme. Chances are he won’t forget 2017 in a hurry. An All-Ireland winner at under-21 and senior football level with Dublin, a club hurling All-Ireland championship, an imminent All Star and and Young Footballer of the Year award, O’Callaghan would be forgiven if he feels this morning like he’ll never again lose a match. Just as Cuala might be convinced now that they could turn the Dublin hurling scene into their own personal fiefdom. When you’ve already become the first Dublin club to win an All-Ireland senior title, when you’ve already done back-to-back county titles, it might conceivably seem hard to reconcile the level of effort with going and winning again. 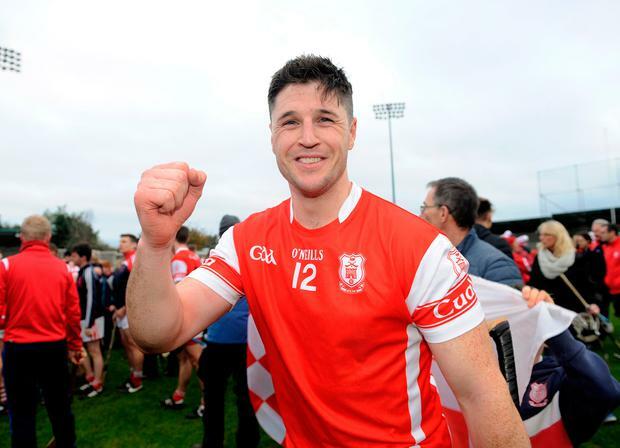 Yet with Cuala, as Paul Schutte pointed out in his winning captain’s speech in Parnell Park on Saturday following his side’s 1-13 to 0-13 victory over Kilmacud Crokes, inspiration and challenges are found everywhere. In the club. Even in their own homes. “We’re a very driven bunch,” he noted afterwards. “There’s a lot of us whose Dads have won three Championships. So that was always a goal in our minds. “To match my Dad and captain the team, like my Dad captained the team. That was always in our minds. They lost their first Championship match (in their round-robin group) as All-Ireland champions to Ballyboden St Enda’s but as David Treacy explained, they were in need of a reboot. And that process was handled masterfully by their manager. “Mattie (Kenny) is very astute and he realised we needed a break,” the Dublin forward explained. “So he gave us a break over the summer. “If lads wanted to go away, they could. We regrouped after September and started building and building again, bit by bit. “The main thing is when we were playing, we were never as good as we had been in the past. We were nearly excepting to be as good as we were in March, which was never going to happen. “To win the first one, after 21 years, was brilliant. Because my father was on the last one to win one in ’94, so that was our driver,” he went on. “But they won three (Dublin SHC titles). My father (John), Con’s father (Maurice), Paul’s (and Mark’s) father (Carl). “So this year it was to match them. “So that was the motivation this year and it’s great to do that. “It’s amazing. The last year just gone was the best year of my life. And that’s what we’re all chasing again. Moments like this. “It’s really special to see everyone here out on the pitch. “This is our time now and we have to take advantage,” added Treacy. “That Ballyboden St Enda’s team a few years ago won five in-a-row. “And we’re looking to strive towards that,” concluded Treacy.